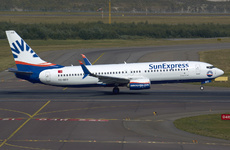 SunExpress flight XQ171, Boeing 737-800, returned to land at Hamburg-Fuhlsbüttel Airport, Germany, after suffering a tail strike on takeoff from runway 33. The aircraft took off at 13:24 hours and the crew arrested the climb before reaching 4000 feet. The flight circled and landed safely on runway 23 at 13:36.